I’m like a broken record when it comes to entitlement spending. I’ve explained, ad nauseam, that programs such as Medicare, Medicaid, Obamacare, and Social Security must be reformed. In part, genuine entitlement reform is a good idea because you get better economic performance when you replace tax-and-transfer schemes with private savings and competitive markets. But reform also is desperately needed because of changing demographics. Simply stated, leaving all the entitlement programs on autopilot is a recipe for a Greek-style fiscal crisis. If you want a rigorous explanation of the issue, my colleague Jeff Miron has a must-read monograph on the topic. You should peruse the entire study, but here’s the key conclusion if you’re pressed for time. …this paper projects fiscal imbalance as of every year between 1965 and 2014, using data-supported assumptions about gross domestic product (GDP) growth, revenue, and trends in mandatory spending on Social Security, Medicare, Medicaid, and other programs. 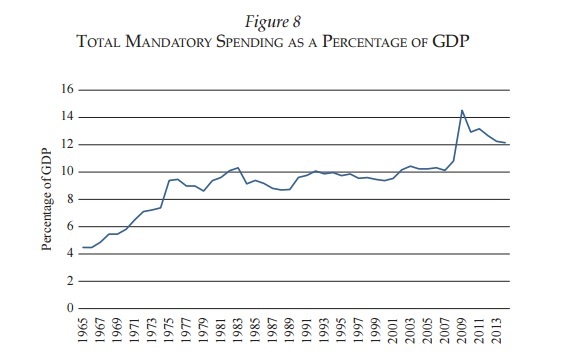 The projections reveal that the United States has faced a growing fiscal imbalance since the early 1970s, largely as a consequence of continuous growth in mandatory spending. As of 2014, the fiscal imbalance stands at $117.9 trillion, with few signs of future improvement even if GDP growth accelerates or tax revenues increase relative to historic norms. Thus the only viable way to restore fiscal balance is to scale back mandatory spending policies, particularly on large health care programs such as Medicare, Medicaid, and the Affordable Care Act (ACA). Jeff’s report is filled with sobering charts. I’ve picked out three that deserve special attention. First, here’s a look back in history at the growing fiscal burden of entitlement programs. Second, here’s a look forward at how the fiscal burden of entitlement programs will get even worse in coming decades. Keep in mind, by the way, that the two above charts only show the fiscal burden of entitlement programs (sometimes referred to as “mandatory spending” since the laws “mandate” that money be given to anyone who is “entitled” based on various criteria). When you add discretionary (annually appropriated) spending to the mix, as well as interest that is paid on the national debt, the numbers get even more grim. Jeff adds everything together and shows, for each year between 1965 and 2014, the “present value” of the gap between what the government is promising to spend and how much revenue it is projected to collect. These numbers are especially horrific because “present value” is a measure of how much money the government would have to somehow obtain and set aside in order to have a nest egg capable of offsetting future deficits. Needless to say, the federal government did not have access to $118 trillion (yes, trillion with a “t”) in 2014. And if there were updated numbers for 2015 and 2016 (which would probably be even higher than $118 trillion), the federal government still wouldn’t have access to that amount of money either. Especially since the total annual output of the American economy is about $18 trillion. So now you can understand why international bureaucracies like the IMF, BIS, and OECD estimate that the fiscal challenge in the United States may be even bigger than the problems in decrepit welfare states such as France and Italy. Let’s get another perspective on the issue. James Capretta of the Ethics and Public Policy Center warns about the scope of the problem. Despite what presidential candidates Donald Trump and Hillary Clinton have been saying on the campaign trail, the need to reform the nation’s major entitlement programs cannot be wished away. The primary cause of the nation’s fiscal problems, now and in the future, is the rapid rise in entitlement spending. 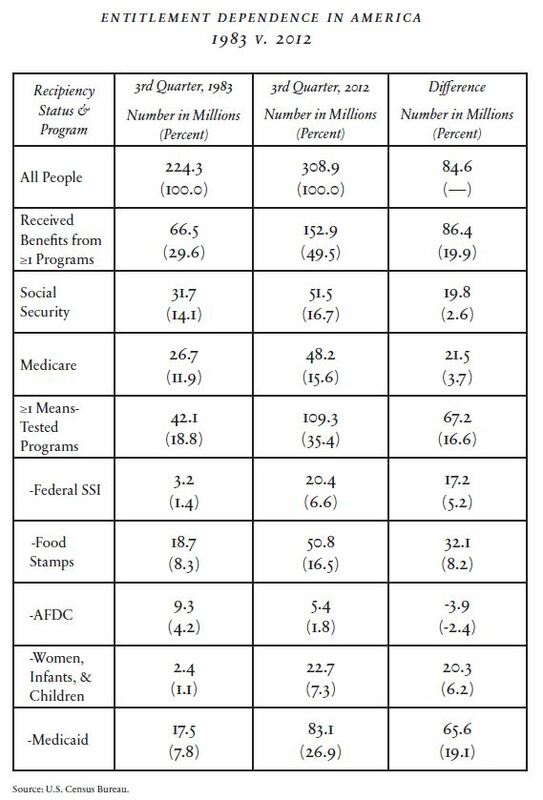 In 1970, spending on Social Security and the major health care entitlement programs was 3.6 percent of GDP. In 2015, spending on these programs was 10.3 percent of GDP. By 2040, CBO expects spending on these programs to reach 14.2 percent of GDP. …entitlement reform is needed to put the federal government’s finances on a more stable foundation. He outlines his preferred reforms, some of which I heartily embrace and some of what I think are too timid, but the key point is that he succinctly explains the need to act soon to avoid a giant long-term problem. …reforms are not intended to create budgetary balance in the short-run. Large-scale change cannot be implemented in the major programs without significant transition periods, which means the reforms need to be enacted soon to reduce costs in fifteen, twenty, and twenty-five years. 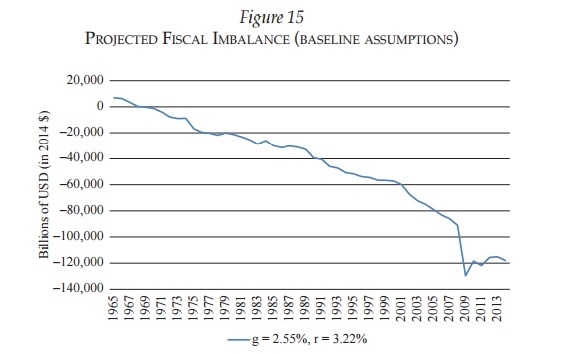 Skeptics may say it’s pointless to worry about fiscal problems that are more than twenty years off. They’re wrong. …The result is a misallocation of resources that undermines long-term economic growth. …Entitlement reform is an absolute necessity, as will soon become evident to everyone, one way or another. The recent testimony by Nicholas Eberstadt of the American Enterprise Institute also is must reading. In just two generations, the government…has effectively become an entitlements machine. …transfers have become a major component in the family budget of the average American household-and our dependence on these government transfers continues to rise. …Fifty years into our great social experiment of massive expansion of entitlement programs, there is ample evidence to indicate that the unintended consequences of this reconfigutation of American political and economic life have been major and adverse. You should read the entire testimony, which is a comprehensive explanation of how entitlements are eroding American exceptionalism. And I’ve previously shared some of Eberstadt’s work on the growing dependency crisis in America. In effect, our “social capital” of self reliance and the work ethic is being replaced by an entitlement mentality. At the risk of understatement, that won’t end well. Heck, I don’t know which part is more depressing, the ever-growing burden of spending or the fact that more and more Americans think it’s okay to live off the labor of others. All I can say for sure is that this combination never was, is not now, and never will be a recipe for national success. Let’s conclude with some sage observations by George Melloan of the Wall Street Journal. He summarizes the problem as being a combination of too much spending and too little political courage. Here’s the too-much-spending part. …we seem richer than we actually are because we have borrowed so heavily from future generations. …the nation’s slow growth and rising debt are already reducing the opportunities for upward mobility. …Recent projections of the future cost of current government obligations certainly won’t relieve…people’s worries. Those promises have expanded far beyond any reasonable projection of the government’s ability to extract enough revenue to cover them. 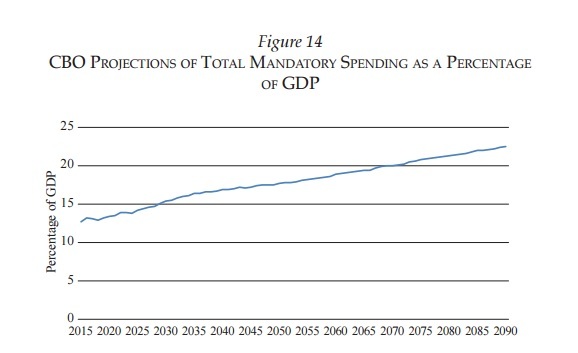 …The Congressional Budget Office projects a steady rise in “mandatory” (i.e., entitlement) costs as a share of GDP out into the distant future. …The upshot: Americans are deep in debt, mainly thanks to government excesses. And here’s the too-little-political-courage part. The only real answer is that the entitlement programs will have to be reformed, and sooner better than later, because the longer reform is postponed the greater the fiscal imbalance will become and the greater its drain will be… Donald Trump is out to lunch on this issue, as he is on most questions that require more than a fatuous sound-bite answer. As for Hillary…, forget about it. For additional background on the issue of debt, unfunded liabilities, and present value, this video is a great tutorial. P.S. I must have taken LSD or crack earlier this year. That’s the only logical explanation for saying I was optimistic about entitlement reform.